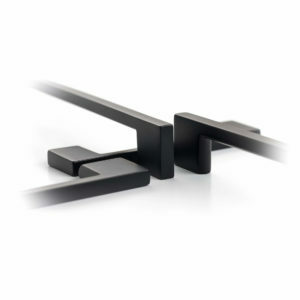 In fashion, black never goes out of style and this is no different when it comes to architectural hardware. A highly versatile finish, black can make a bold statement in your kitchen or bathroom design, evoking a luxurious look & feel. From the Nostalgia Collection of mid century designs, the classic Kennedy cup pull and knob in matte black complements a variety of architectural styles such as Shaker & Hamptons cabinetry. The Cleat has a sleek and stylish aesthetic for both the modernist and traditionalist. From the Linear Collection, the Cleat in matte black caters to the latest trends in design, suitable for a wide variety of cabinetry styles. View more ranges from our sophisticated collections that are available in Matte Black. We have also been proud to supply many separate projects with our Castella Ranges in Matte Black. Take a look through our Inspiration Gallery to view these stunning designs!